Sener Ingenieria y Sistemas' FORAN System is a suite of software modules specific for the design and production of all types of ships and floating structures. It is currently being used worldwide in a large number of shipyards and marine design offices. Its presence in the market dates from the late 60s, when the first license was granted to a shipyard, namely to E.N. BAZAN (now part of IZAR). To ensure the program stays relevant, Sener has optimized the program by incorporating the latest technologies in information systems and in 3-D graphics hardware, and at the same time satisfied the ever increasing demands from very discerning customers for new and improved features. Sener recently announced version 50, the next FORAN release, which it will launch during this year. This article highlights some of the main features of this new FORAN. FORAN proprietary database. However with the passing of the years and the appearance of new technologies, which at the same time is related to the ever increasing use of concurrent engineering technology, the decision to change this proprietary database and its associated management software has proved to be necessary. Thus in version 50 of FORAN the proprietary database has been sub- stituted by a standard commercial relational database. System to do with the input/output of information, and has adapted the data struc- ture to be in accordance with the requirements of the latest technology for data- base management. Another feature of the new version refers to the representation of the ship forms and main surfaces (i.e. decks and bulkheads). The current tendency is to repre- sent the main surfaces of the ship by means of NURBS (non-uniform rational B- spline) patches. These are mathematical surfaces of general application which include as a particular case those surfaces most used in shipbuilding such as con- ics and Bezier. Version 50 of FORAN includes a new module for the definition of ship forms using NURBS and the rest of the System has been adapted to be able to treat the resulting surfaces. With this improvement the traditional method of representing surfaces by a mesh of three-dimensional lines has been superseded. Thus the pos- sible inaccuracies of this method that may be introduced when carrying out geo- metrical interpolations to calculate points and lines that are not contained within the main grid have also been eliminated. 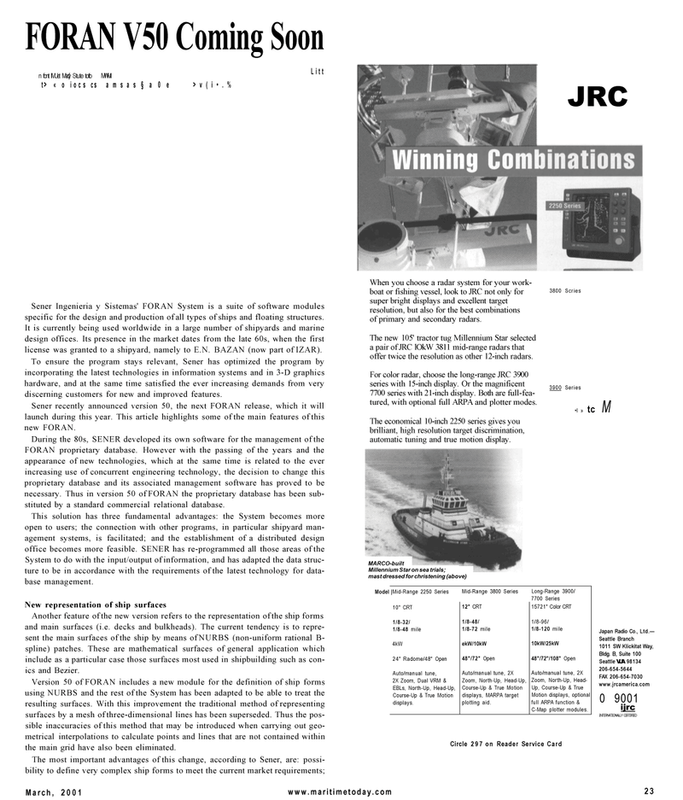 When you choose a radar system for your work- boat or fishing vessel, look to JRC not only for super bright displays and excellent target resolution, but also for the best combinations of primary and secondary radars. For color radar, choose the long-range JRC 3900 series with 15-inch display. Or the magnificent 7700 series with 21-inch display. Both are full-fea- tured, with optional full ARPA and plotter modes. Course-Up & True Motion displays. Course-Up & True Motion displays, MARPA target plotting aid.